TRACES OF THE PAST are very much evident in these pictures, taken in the city and out in the country around the beginning of October 2000. A rich industrial, architectural and social heritage is sometimes celebrated, often neglected and frequently hidden. But it's all there around us, if we care to look. QUEEN'S ROAD CHEETHAM isn't the most remarkable place in the universe, but it's a location many EWM readers have connections with, and so I include it here. Over to the right, on the other side of the road is the empty patch of ground known as 'Barney's Croft', next to the entrance to the Metrolink depot. On the immediate left is Hawkhead Road. We notice that the walls and railings look almost new. Many houses and streets this area have benefited from renovation work, part of the drive to regenerate north Manchester. The junction with Rochdale Road is about half a mile ahead, and Cheetham Hill Road is about half a mile in the other direction. BARNEY'S CROFT is an area of vacant land south of Queens Road Cheetham. It has not been built on, though there are plans for a trading estate, and a new Irish World Heritage Centre, so this scene will soon change. This grassy expanse is a haven for weeds and wild flowers. It would be a great place to come to as a child, though fear of crime means most people won't venture here, even by day. There are great views over the Irk Valley and towards Manchester city centre. THE IRK VALLEY is seen here looking from the grassy mound on Barney's Croft, Cheetham, above the Metrolink depot. The river Irk passes behind the factory buildings lower right and flows on into the centre of Manchester, where it meets the Irwell. The railway viaduct of the Cheetham Hill and Collyhurst connecting line, now used by Metrolink trams, can be seen as it curves its way along the valley. St Malachy's School, Collyhurst, can be seen in the left hand picture. The blocks of flats on the left, near Queen's Road, have been modernised, though the ones on the right, off Rochdale Road Collyhurst, are in bad condition. Up till the 1950's, this was an area of slum housing and factories. Now it's mostly covered by trees. 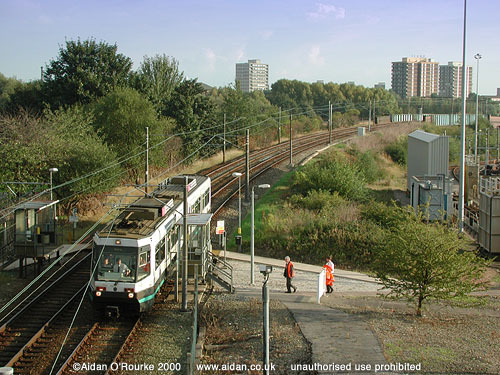 METROLINK TRAMS run along the Collyhurst and Cheetham connecting line between Manchester city centre and Bury. The Metrolink tram system was opened in 1992. 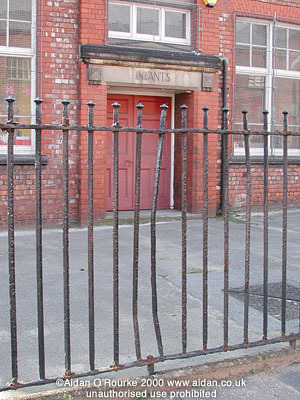 The tram depot is on the site of former railway sidings, next to Queens Road. There is a special stop where tram drivers get on and off at the start or end of their shift. We are standing on Queens Road bridge, looking south towards Collyhurst and the city centre. 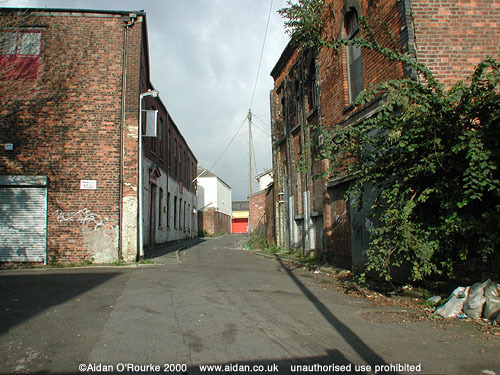 ST MARK'S LANE runs off Cheetham Hill Road past an old graveyard and leads into a new housing estate. This street must have been important in times past - nowadays the buildings are empty and the street is used as a short cut to the shops. Along St Mark's Lane to the left is a disused school. An original stone inscription states: "St Mark's Sunday School, erected by subscription 1815". The street was once cobbled but is now covered in tarmac. This location, rich in local heritage, could have been restored and developed with shops and cafes, rather than being left derelict as it is now. 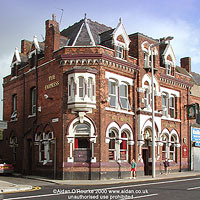 THE EMPRESS PUB on Cheetham Hill Road is a fine example of a Victorian pub - named after Queen Victoria. In the high Victorian era, Cheetham Hill was one of Manchester's most prosperous suburbs. In September 2000, the Empress is still there, though much around it has changed. Note the brand new stainless steel lamp post, recently installed as part of an upgrade to Cheeham Hill Road. 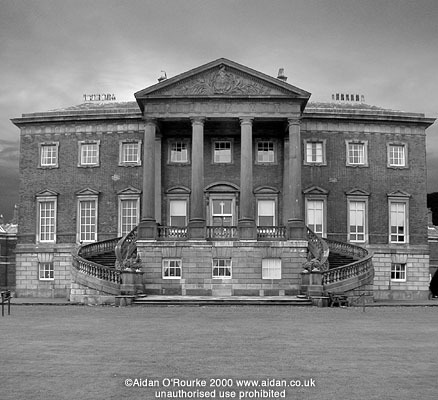 TABLEY HOUSE, is situated about 15 miles south east of Manchester, near the town of Knutsford. Designed by John Carr of York (1723 - 1807) and completed in c1767, Tabley House is one of the most magnificent Palladian* houses in the north west of England and the only one in Cheshire. (*Palladian: in the neoclassical style of the 16th century Italian architect Palladio). It belonged to the Leicester family. In 1947 it was converted into a private school. After the death in 1975 of the last remaining heir - Lt. Col John Leicester-Warren - the property was offered to the National Trust, but they declined, as the estate didn't meet their criteria. Manchester University then acquired the property. The school closed in 1984. In 1988, the university sold a 125 lease of the house and adjoining buildings to Cygnet Healthcare for use as a nursing home. Cygnet Healthcare have carried out extensive restoration work on the house. Only the rooms on the first floor (entrance at the top of the steps) are open to the public, but they are magnificent and well worth the visit. They are managed by the Tabley House Collection Trust. Tabley House is open to the public from April to October - Admission for adults is £4. THE PICTURE GALLERY OF TABLEY HOUSE, near Knutsford, is regarded as one of the great rooms of Cheshire. It is filled with superb paintings, furniture and historical items, many of them much older than the house itself. The house was begun in 1761 and completed around 1767. The origins of the Picture Gallery are obscure. 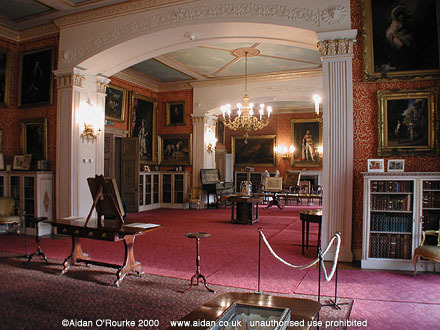 It was thought to have been designed around 1792 and completed in subsequent years, but according to later research, this room dates from around 1840-45. The only way to experience this room is to visit it in person - volunteer attendants will tell you all about it. Tabley House is open to the public from April to October - Admission for adults is £4.